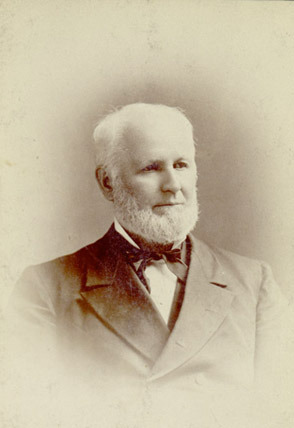 Portrait of John Barbee Minor, no date. "Old John B." joined the faculty as professor of law in 1845 and continued in that position for half a century. It was he who waved the white flag of surrender when Union troops under General George A. Custer advanced upon the University in the spring of 1865. After the war Minor and Professor Socrates Maupin borrowed money on their personal credit to keep the University going. John B. 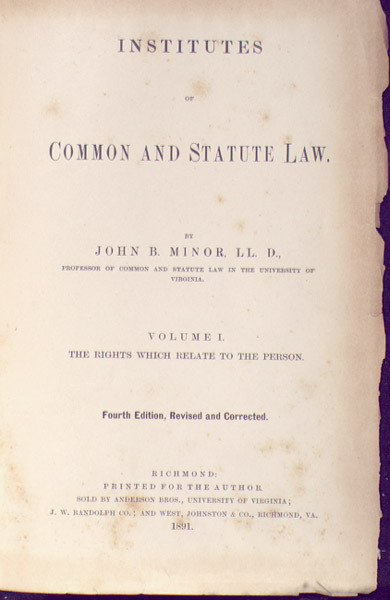 Minor, Institutes of Common and Statute Law. Richmond, 1891. Minor's legal scholarship was known throughout the South and his standard Institutes of Common and Statute Law, first published in 1875, was studied by generations of law students. 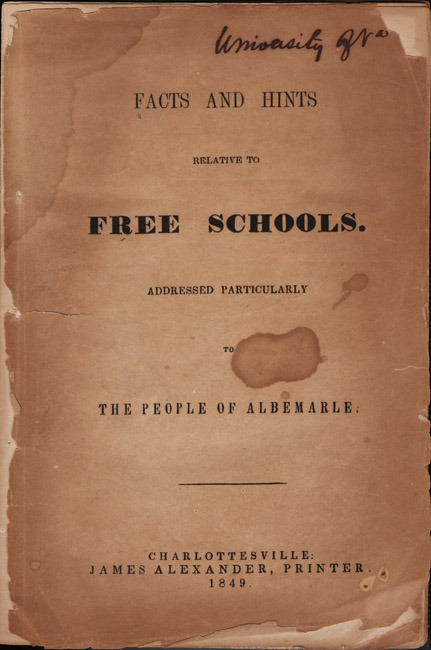 John Barbee Minor, Facts and Hints Relative to Free Schools Addressed Particularly to the People of Albemarle. Charlottesville: James Alexander, 1849. His interest in education extended beyond the University to public education of the children of Virginia as well. In 1849 he published Facts and Hints Relative to Free Schools Addressed Particularly to the People of Albemarle which refuted common arguments that a free education is demeaning public charity, necessitates excessive taxes, and promotes promiscuous association of the sexes. In 1867 Minor, Robert E. Lee as president of Washington College, and Robert Lewis Dabney of Union Theological Seminary were appointed by the Educational Society of Virginia to prepare an address to the parents of Virginia on the necessity of cooperation with teachers. 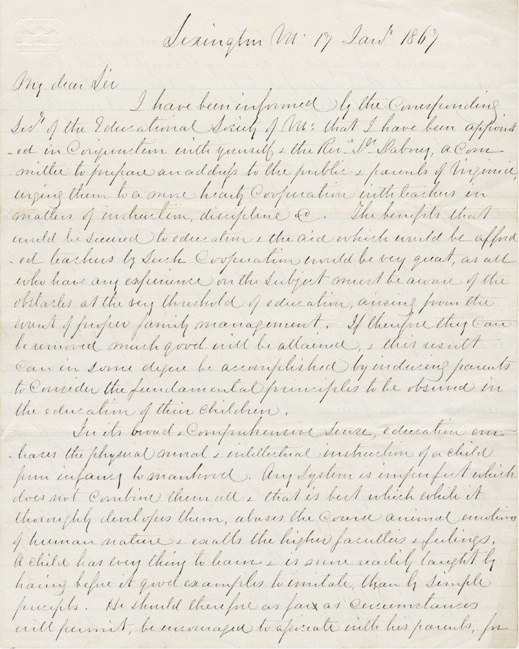 Lee wrote to Minor discussing the principles of early education in the family.